The Religious Right is a movement with a mission - to restore Christian supremacy in politics, law and culture. Unless it succeeds, it claims, the liberal, secular state will persecute Christians. Written from a Christian perspective, ‘The Jesus Candidate’ explains this movement’s defining ideas, through its rise in America and its spread to Britain. Why are many Christians ready to call for resistance to the secular state? What are the alternatives? ‘The Jesus Candidate’ challenges the Religious Right’s appraisal of modern politics. It analyses cases said to show that the law and the courts are anti-Christian, and disputes the claim that Christianity needs special legal protection or privilege. Liberal, secular politics results from applying New Testament principles and practice to church and state. Understanding this is the key to being ‘salt and light’ in today's world-wide battles over religion and politics. This book speaks to you if you want to know if and how freedom is threatened, and what we can all do about it. 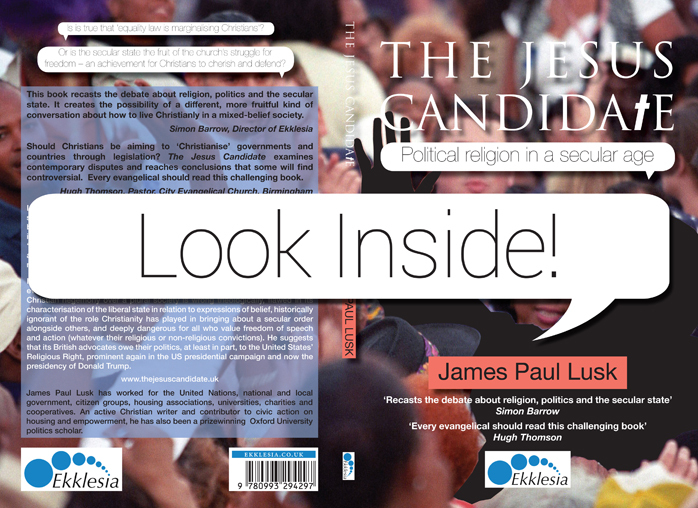 THE JESUS CANDIDATE: Political Religion in a Secular Age by James Paul Lusk is published by Ekklesia.